Music that users uploaded to MySpace was still available on the site until recently. The company migrated servers recently and lost access to all songs as well as photos and videos uploaded to the site prior to 2015. MySpace did not have backups, apparently, so that recovery was not an option. Enter the Internet Archive. Interested users can browse the entire archive on the Archive.org website. The MySpace Dragon Hoard can also be downloaded directly or as a torrent file. Browsing the 144 zip archives directly won't reveal information about the artist or song name, however. You get long lists of cryptic file names only when you do so. There is a metadata file that provides information but linking it to the actual files in the archive is cumbersome and probably best left to automation. A tool has been created, called Hobbit which acts as a music player and search tool to find songs of interest. You may use it to search the archive to find out if certain songs are included in the archive. Just load the Hobbit in a browser and type a song name or artist name to get all matching songs returned to you. The first search will take a moment but subsequent searches are quick and painless. You can play any song found directly in the interface. The player does not support mp3 downloads and there is no link between the found songs and the archived files. Some of the songs, especially those by commercial bands and artists, are just clips and not the entire song. 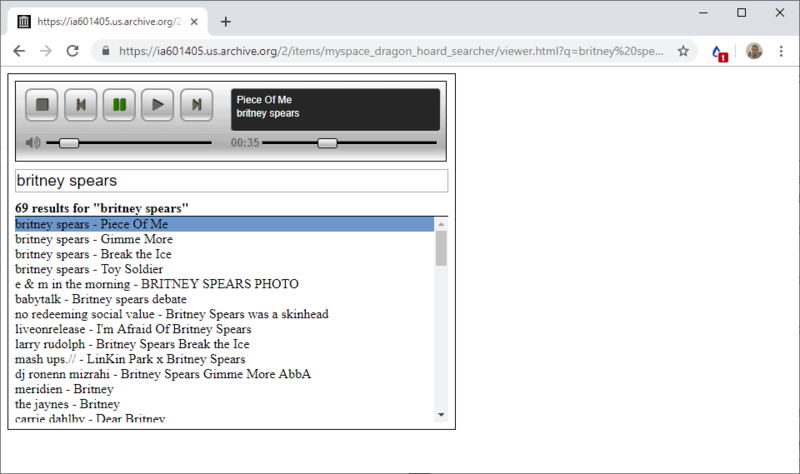 The archive is useful for MySpace users who lost songs that they uploaded between 2008 and 2010 provided that they can remember title or artist. Everyone else may play songs using the online music player or download the archive. The Internet Archive hosts a treasure trove of content that is no longer available on the Internet or elsewhere. You find Winamp Skins, arcade games, classic computer and game magazines, as well as classic DOS games, C-64 games and other games on the site. Now You: Did you use MySpace back in the days? The Internet Archive got its hands on part of the uploaded MySpace music archive and uploaded it in its entirety to the Archive. I used to have a MySpace account around 2007-2008, but I deleted it around 2010… I kinda feel bad I did, because I wish I could log in and revisit it… too bad even the WebArchive hasn’t recorded my account. I think MySpace was great, even better than facebook, at least during its early years where you could fully customize your profile with themes, wallpaper, music auto-playing and so much more. When Justin Timberlake bought it, it became unrecognizable and I didn’t like it anymore. Myspace wasn’t bad. It was actually better and more useful to me than FB. It was like a personal web page without the work of setting up a webpage. ..but you could also link to friends and actually see what they posted unlike FB that ‘curates’ everything away so you don’t see the majority of what your friends post. Don’t worry too much about logging in to see what you had. I kept my myspace around and logged in years later. They had already deleted everything I had and were trying to promote their mp3 focus which never caught on. Links to friends was the only thing that remained. The lost music must have been in some other backup area not linked to accounts unless my account got special treatment for some reason. We are glad they saved Britney Spears! I never cared for myspace. It lured in the bros and h**s type of people. Same thing happend with twitter, facebook and youtube instgram. Any buggle with an a**hole can flash their redundant protoplasm and spread their opinions world wide without any effort now days. I miss when the internet wasn’t some giant shopping mart with some bulls*t sprinkle about. The internet was made by nerd for nerds. you were labled a loser if you spend all day online, now we have Instagram and Vloggers, Streamers. Also 1billion+ profitable movies based on comic books???? What the ever loving f**** happened. Ok, I’m just rambling. what I’m trying to say is the internet was a mistake and the archive is doing humanity a disservice by saving all this crap!! MySpace wasn’t mine really but I remember several of my musician friends who loved the area, so well fit for personalizing their space. I stopped visiting MySpace at the time I started using privacy/security filters/blockers (OS-wide and browser specific) which brought most of the artists’ nirvana pages to appear badly rendered. Whatever, MySpace is part of the Web’s history, undoubtedly.